In November I wrote the first draft of a 50,093 word novel. That’s 206 pages (double-spaced). Untitled most of the month, now it’s called The Daily Middle School Chronicles. The synopsis goes like this. A spoonful of comedy and a pinch of tragedy make for an unmistakeable dose of middle school in epic, end-of-the-world, life-ruining proportions. This story is about three friends just trying to survive the eighth grade, and each other. I had a fun journey through the word count madness, by getting out of the house and writing with people. I want to send a big shout out to my G+ circle– not sure how so many of you posted so often and finished writing your novel– and weekend write-in crew at Panera Breads at the South Bay Pavilion. You all did fantastic jobs of writing, motivating me to write, and plain old being good company in between all those word sprints. I feel the need to mention that I was one of the lucky few to witness the brilliant sheen of two thousand (2000) stickers meant to reward our progress at a write-in. Lots of these stickers featured dinosaurs (a definite bonus). Aside from being declared a NaNoWriMo winner, this week was also awesome because I had apple pie, which I’d been craving all month long. I had such a big craving that when I randomly spotted some apple pie-flavored gum I bought that, which actually tasted just like apple pie. The real apple pie was better though. Check it out. 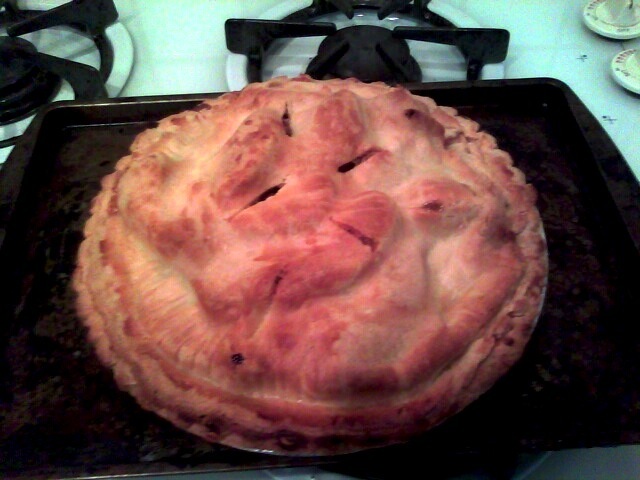 Homemade Granny Smith Apple Pie. It was as tasty as it looks. mmm...pie. Coming up: There’s my local “NaNoWriMo: Thank Goodness It’s Over” party this weekend to look forward to, as well as going to bed early slightly earlier because I don’t need to stay up as late to write a novel. 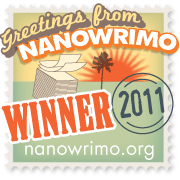 Next time I’ll post what I learned from NaNo 2011.